Pashler, H., McDaniel, M., Rohrer, D., & Bjork, R. (2008). Learning styles: Concepts and evidence. Psychological Science in the Public Interest, 9(3), 1–18. In the article "Learning Styles: Concepts and Evidence," Pashler and his colleagues examine the popular belief that different students have different styles of learning and that students reach their potential only through instruction consistent with their learning style. As evidence of the popularity of this belief, the authors point to the sheer number of proposed schemes and models of learning styles (for example, 71 in Coffield et al., 2004) and the success of commercial materials based on the hypothesis (for example, Keefe, 1998; Yale Graduate School of Arts and Sciences, 2009). Psychological Science in the Public Interest commissioned the current study to analyze the concept of learning styles, determine what sort of evidence would support the learning style hypothesis, and explore the empirical evidence from high-quality studies to determine whether this belief is justified. The authors are careful to distinguish student study preferences from the learning style hypothesis. That is, students might be able to reliably say what type of instruction they prefer, but this preference is not evidence for differential performance under different instructional styles. The specific version of the learning style hypothesis under consideration is what the authors call the meshing hypothesis, in which instruction is matched to the student’s identified learning style. Learners are assessed and assigned to learning style groups. Learners are randomly assigned to two different learning methods. All learners are given the same test of achievement. The results show that the method that optimizes achievement for one group does not do so for the other group. The acceptable evidence for the validity of the meshing hypothesis would be a disordinal interaction (Figure 1), in which visual learners, for example, learn more poorly in a classroom that has a high auditory learning component than in a classroom that has a high visual learning component. 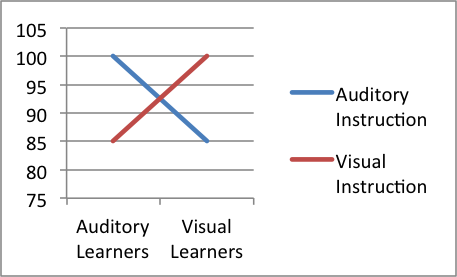 Likewise, auditory learners would perform poorly with visual-based instruction and would do well with an instructional method that emphasizes their auditory learning preference. On the other hand, the appropriate conclusion to draw from an ordinal interaction (Figure 2) is that one form of instruction is more beneficial for both types of learners, so customization of instruction is not necessary. Despite an exhaustive search of the learning styles literature, only one study met the four criteria listed above (Sternberg, Grigorenko, Ferrari, & Clinkenbeard, 1999). But methodological problems blunted the impact of this study. In addition, multiple methodologically strong studies had negative results, failing to find the required disordinal interaction. The authors are quick to point out that these negative results do not provide conclusive evidence against the learning styles hypothesis, but they do question the application of learning styles in the classroom. The authors then cast a wider net, looking in related bodies of literature to determine whether results were different for students with differing abilities or personality traits, such as locus of control (locus of control describes the extent to which individuals believe that their performance is affected primarily by internal or external factors). Some, but not all, studies found that structured instruction helped low-ability learners and flexible instruction benefited high-ability learners. Similarly, other studies found modest evidence that students with internal locus of control benefited from less structure and students with external locus of control benefited from more structure. But the applicability of these results to the meshing hypothesis is unknowable, so the evidence is weak and tangential. The evidence in support of learning style assessment and instruction is fragmentary and unconvincing. An evidence-based approach to education should draw from the results of valid studies, not beliefs. The authors note the “growing evidence that people hold beliefs about how they learn that are faulty in various ways, which frequently lead people to manage their own learning and teach others in non-optimal ways” (Pashler et al., 2008, p. 117). Current lack of evidence does not disprove the theory. However, future examinations of the meshing style hypothesis should classify students with a clearly specified measure, randomize students to instruction groups, and test for a learning style by instructional method interaction, with acceptable evidence of validity being a disordinal interaction (see earlier discussion and Figure 1). Additionally, future studies should be adequately powered to detect an interaction that is large enough to suggest a meaningful difference in performance. Even if the evidence had been more favorable for the meshing hypothesis, a cost-benefit analysis would be required to determine whether the increased learning would offset the cost of adding assessments, creating and validating different instructional methods, hiring additional teachers, and providing teacher training. Finally, the cost of implementing this approach would have to be compared to other potential interventions to improve student learning. The learning style hypothesis is widely popular, despite the lack of evidence to support it. We should put research dollars and effort into finding methods that benefit all learners. Coffield, F., Moseley, D., Hall, E., & Ecclestone, K. (2004). Learning styles and pedagogy in post-16 learning. A systematic and critical review. London, UK: Learning and Skills Research Centre. Cronbach, L. (1957). The two disciplines of scientific psychology. American Psychologist, 12, 671–684. Keefe, J. W. (1988). Profiling and utilizing learning style. NASSP learning style series. Reston, VA: National Association of Secondary School Principals. Sternberg, R., Grigorenko, E., Ferrari, M., & Clinkenbeard, P. (1999). A triarchic analysis of an aptitude-by-treatment interaction. European Journal of Psychological Assessment, 15, 1–11.